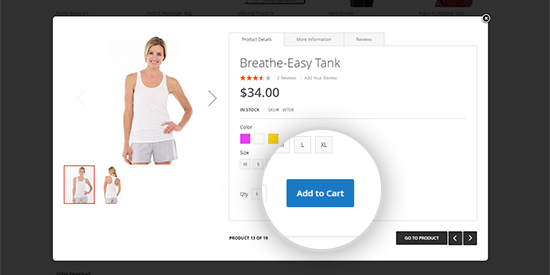 Magento 2 Quick View brings a convenient experience to the shoppers: for any item they pay attention to, only one click is needed to reach the item info. There will be no more loading page for product detail but a pop-up window with Add-to-Cart button appears in no time. Allow to set initial width/height of Quick View popup window when Quick View opens. Automatically apply the style of your chosen theme, so it helps to avoid potential conflict with any 3rd-party theme. 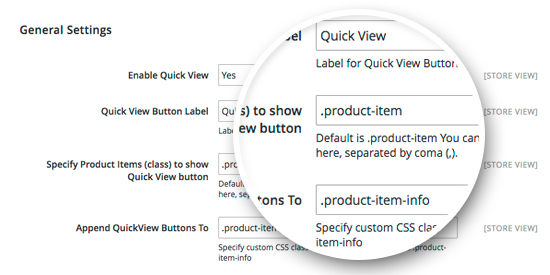 Magento 2 Quick View is helpful for pages with too many item selections. Thus, it is a must-have Magento extension for the category pages and search result pages. 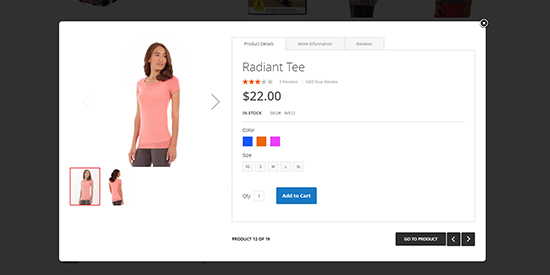 Shoppers now can access the product details at ease through pop-up windows once clicked on the item images. No more loading pages need. 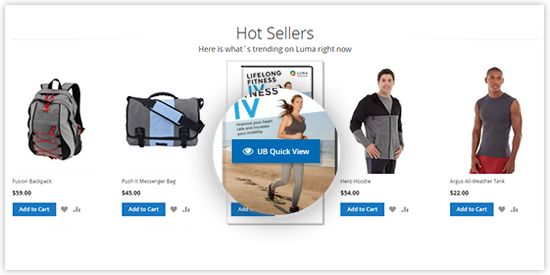 Normally to add any item into shopping cart, shoppers need to navigate to the product page. With Quick View, there is already the Add-to-Cart button in the pop-up window. 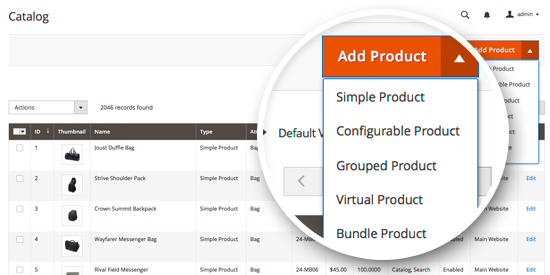 Depending on your specific store, UB Quick View seamlessly works with any of product types that come packed with Magento 2: simple, grouped, configurable, virtual, bundle, downloadable. UB Quick View automatically uses the style of your chosen theme, so for the most part this extension will integrate nicely with any Magento theme. You can extend with your custom style as well. Bug with UB Quick View? In love with UB Quick View? UB Quick View is packed in the following Magento themes. FREE signup to access premium Magento themes with UB Quick View packed-in.